I woke up early at 5:00 o’clock to take a look at this marvelous conjunction. It was still night at the time and I was surprised with a mighty view of the rising Orion. I waited on my balcony for until the planets were visible over the roofs in front me. I quickly took my pencil and drew what I saw on the eyepiece of telescope, but the seeing was awful and just two moons were visible. 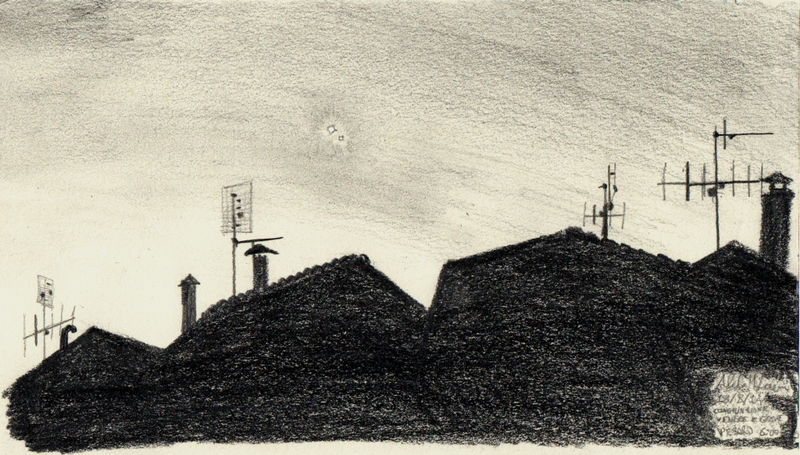 The view of this two small lights dancing together over the roof in the cold morning was much more intriguing, so I tried to sketch the whole landscape. Never tried this kind of astronomy sketch before, probably my first landscape since I was a child. Hi Aldo, that’s what I call a nice souvenir ! Very nice sketch. Two bright planets together.